Creative’s Fatal1ty Gamer Headset provides power, precision and comfort for the serious gamer. The ergonomic, lightweight design, with padded velvet earpieces and headband, ensures a comfortable fit during extended gaming sessions. Weapons, positional cues and environmental audio effects sound fantastic through the high-quality drivers, with excellent bass response for powerful explosions. 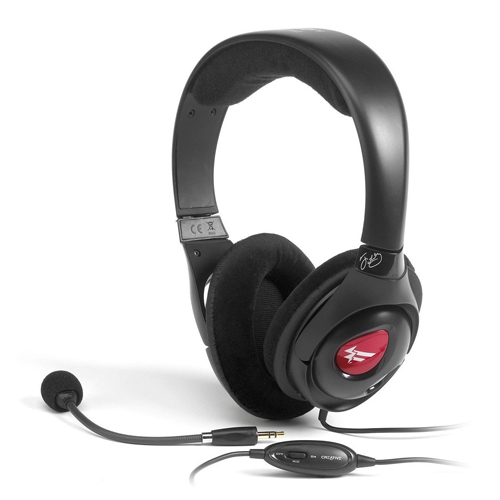 The noise-cancelling microphone transmits voice commands clearly to other team members, and it can be detached for easy storage or to use the headset like regular headphones. In the heat of battle this is the headset that won’t leave people stranded – and that’s why Johnathan ‘Fatal1ty’ Wendel, the world’s best known pro gamer, uses it. The Fatal1ty Gaming Headset is one of the first Headsets I purchased and would do so again. The headset is extremely comfortable with velvet lining on the cushions which are still comforatable to wear after 8 hours or more! The Sound quality is extremely good for its price. There’s good bass from the Fatal1ty which is great for gaming. The Fatal1ty headset comes with a detachable microphone which is perfect when your buddies aren’t around on vent/team speak. So makes this microphone passable to wear outside while listening to music. The quality of the recording with the microphone is good enough so no issues here. If you’re looking for the best value gaming headset then you really have to look no further than the Fatal1ty headset. Retailing from anywhere around £25 upwards it’s hard to find a better headset than this. I Give the Creative Fatal1ty Gaming Headset a FTW 5/5! – Excellent value for money! – Microphone may be prone to damage from removing over time. So treat it well! Best place to buy Fatal1ty Headset?